As Modi government completes one year at the Centre on May 26, the Bharatiya Janata Party is making grand plans to commemorate this occasion. The party has planned around 250 rallies across the country and one rally in each Lok Sabha constituency. Celebrations to commemorate the completion of first year of the National Democratic Alliance government would commence from the native village of Jan Sangh leader Deen Dayal Upadhyay on May 25 with a public rally of Prime Minister Narendra Modi. Modi will address the rally at village Nagla Chandrabhan in Mathura of Uttar Pradesh, which is Upadhyay's birth place. 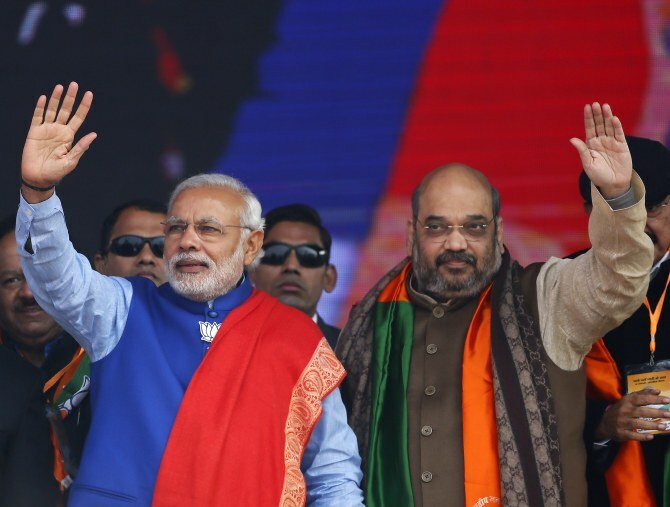 BJP sources said this will be the first of a series of public rallies being organised by the BJP across the country during the week long celebrations from May 26 to 31 that will be addressed by various leaders. BJP members of Parliament and members of Legislative Assembly are likely to attend more than 500 press conferences. Union ministers and BJP MPs and functionaries will fan out across the country to tell people about the welfare measures taken for the underprivileged sections and farmers as part of a week-long 'Jan Kalyan Parv' which the party has lined up to mark the NDA government's completion of one year in office. These measures include the recently introduced PM Suraksha Bima Yojana, the PM Jeevan Jyoti Bima Yojana and the Atal pension Yojana. Weak WPI data is an eye-opener, Indian govt wake up now!